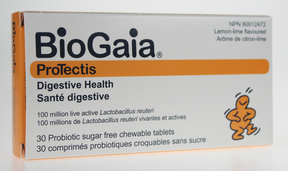 BioGaia ProTectis chewable tablets is a dietary supplement containing Lactobacillus reuteriProtectis. The word probiotic means ”for life” as opposed to antibiotic which means "against life". WHO defines probiotics as live microorganisms which, when administered in adequate amounts, confer a health benefit on the host. Filler (isomalt), sweetener (xylitol), Lactobacillus reuteri DSM 17938 (Lactobacillus reuteri Protectis), palm oil, lemon-lime flavouring and flavour enhancer (citric acid). With sweeteners. Net weight per tablet, 450 mg. Excessive consumption may have a laxative effect..
BioGaia is a health care company that develops, markets and sells probiotic products with documented health benefits. Our products combine the well researched probiotic bacteria Lactobacillus reuteri and top of the line engineering to develop unique packaging solutions that make it possible to create probiotic products that match consumer needs. Lactobacillus reuteri is a “good” and friendly bacterium that helps battle the “bad” microorganisms in the digestive tract, improving the host's health. BioGaia is a world leader in probiotics thanks to over 20 years experience in the field of probiotics. Over the years we have created a global network of leading, independent researchers and specialists, in-house experts and commercial partners worldwide. Headquarters, with executive management, administrative functions and marketing and sales are based in Stockholm. Product development and departments for production and quality control are based in Lund. Research, quality control and product development are also perused in Raleigh, North Carolina, USA. Sales offices are also based in Hiroshima and Shanghai. The class B share of BioGaia is quoted on the Mid Cap list of the Nordic Exchange Stockholm.